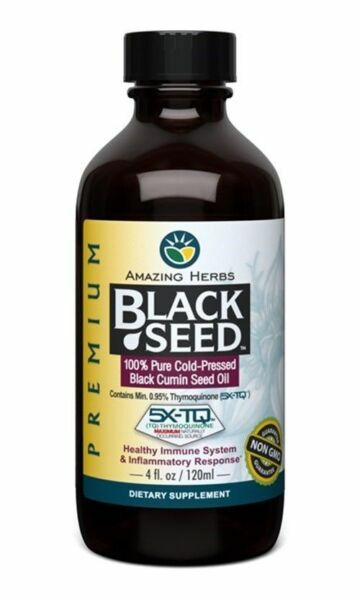 Amazing Herbs - Black Seed Cold-Pressed Oil - 4 oz. Serving Size: 1 Teaspoonful (5g)Servings Per Container: 24Amount Per Serving%DV*Calories45*Fat Cal45 *Total Fat5 g7.5 %Saturated Fat1 g5.0%Black Cumin (seed ) Oil5 g*Omega-3 (ALA)1 g22%Omega-3 (LA)3 g59%*Daily Value Not Established. Other Ingredients: Unrefined Cold-Pressed Virgin Black Cumin (Nigella Saliva) Seed Oil. -International and other rates may apply to out of US-48. -Delivery Confirmation included in shipping. Insurance is free on orders over $250, less than that please ask for invoiced amount. -Returns must be made in same condition and within the return policy time limit. -Wisconsin addresses add 5.6% sales tax.